These cupcakes taste like Christmas. Well, that is if you think Christmas tastes like chocolate mint. We do, so these cupcakes take like our Christmas! These cupcakes are easy to make. I doctored up a box of cake mix and make the buttercream. I don't mind cake mix cupcakes, but I am not a huge fan of canned frosting. I think you can getaway with the cake mix if you make your won frosting. This frosting is out-of-this-world delicious! It isn't overly sweet and tastes just like my favorite bakery. It is worth the little bit of extra effort. 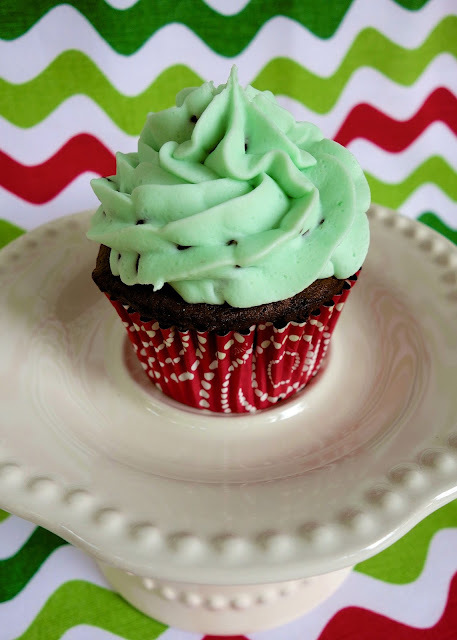 These cupcakes are sure to please all your little elves this holiday season! Prepare cake mix according to package directions. 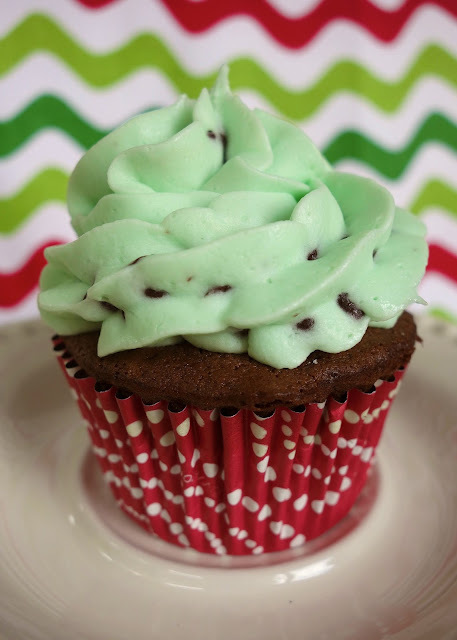 Stir in mint extract and chocolate chips. Bake according to package directions. Allow to cool completely before frosting. In the bowl of an electric mixer fitted with the paddle attachment, cream butter until smooth and creamy, 2 to 3 minutes. With mixer on low speed, add 6 cups sugar, whipping cream, and mint; mix until light and fluffy. If necessary, gradually add more powdered sugar to reach desired consistency. Add green food coloring until it is the desired color. Stir in mini chocolate chips. I can't get enough mint this time of year! These cupcakes are perfect! I love the chips in the frosting. So festive! And, your frosting looks beautiful! I'm terrible at frosting cupcakes. I've featured this recipe on my blog, hoping that you don't mind, but if you do, please contact me and I'll remove it. All the best.